In the summer of 2011, squatters take over an unused building, once an animal shelter, and begin renovating it into a social and cultural center for a neighborhood on the outskirts of Amsterdam. They call it Op de Valreep ("in the nick of time"). But the corporation in charge of it, that has let the building languish for years (OCP, which stands for Ontwikkelingscombinatie Polderweggebied), makes moves to kick the squatters out, and the local city council says it's powerless to oppose the corporation. In September 2011, Yes Lab members facilitate a brainstorm at the squat, and the squatters come up with a plan to publicize the situation in the media and, especially, in the neighborhood. Then, the whole neighborhood is invited to a gifting ceremony, to be presided by city council alderman Thijs Reuten. For the occasion, the squatters wrap the entire building in a giant blue ribbon, with a gift card addressed to the neighborhood. Many people from the neighbourhood, as well as journalists and politicians, show up for the ceremony (click for video), which is complete with (fake) OCP businessmen who interrupt the speech (click for video) before the fake "Reuten" quiets the objection by the OCP stooges, informing them that his government has made its decision. Many of the neighbors in attendance are disappointed to find out it's a hoax, but it increases their desire to see the site used for good. 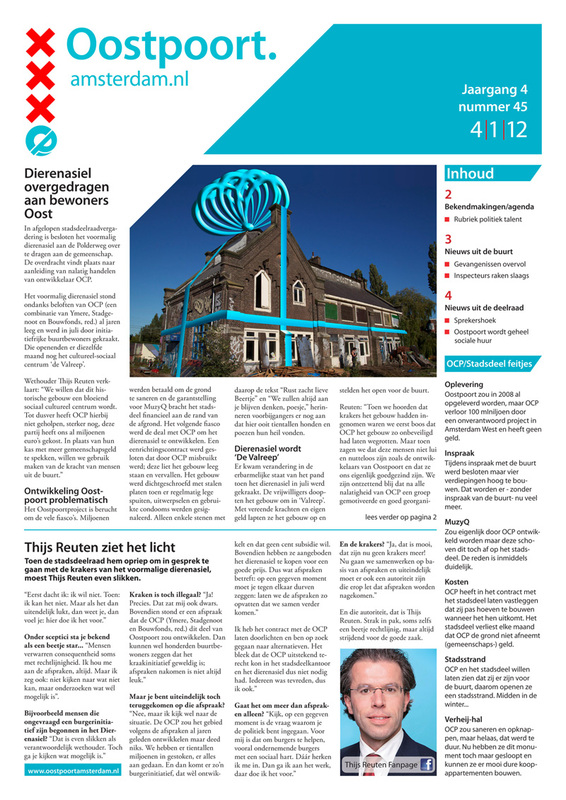 The event makes the top article in the Amsterdam section of Amsterdam's biggest newspaper; in the article, a (real) local politician argues that the building should indeed be given to the neighborhood. Through the whole action, many neighbors are engaged and turned into pro-squat activists, and the de Valreep crew considers it their most successful public campaign to date. Stay tuned—de Valreep has more plans!